Louis Vuitton Bisten suitcase Exclusively painted for Palmer & Penn in Beverley Hills. This is a one off item. Beautifully decorated with travel stickers showcasing leading hotels in the world. 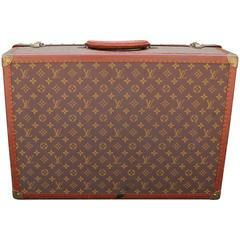 A beautiful Louis Vuitton, 1930s suitcase with collection of vintage stickers. This limited edition piece is from a runway collection of Louis Vuitton. 1 of 10 made this is a truly unique piece and has a statement silver handle. 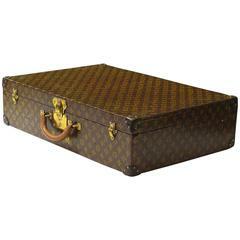 Early patinated Louis Vuitton hard case luggage or trunk. Has original travel stamps and initials of owner. Made in France, circa 1940s. 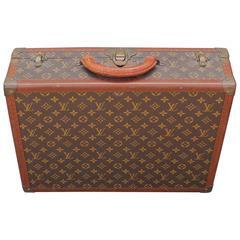 Louis Vuitton: suitcase of monogram canvas with brass hardware, leather trimmings and a leather Handel. Measures: 60 × 40 x 20 cm. Free shipping.